Oh, baby this looks fast! For many years now, Lamborghini and Ferrari have worked their Italian design magic to tug at supercar aficionados’ heart strings like another rendition of “O Sole Mio” in the mother country.Lamborghini was created to spite Enzo Ferrari, who insulted Ferruccio Lamborghini, who was, at the time, a customer. And it’s safe to say, Lamborghini proved his point, his firm designing edgy supercars that with their massive 12-cylinder engines ultimately have put many a Ferrari to shame from a performance standpoint. Among its most recent efforts, the Aventador LP700-4, modeled here by Autoart, is a stellar example. Aventador, named for a famous bull (in Europe), as are all Lamborghinis, features a monster 700 horsepower, 12-cylinder 6.5-liter engine. That raging bull under the rear bonnet pushes the real car to 62 mph in just 2.9 seconds and boasts a top speed of 217 mph, enough to earn you a ticket any time you drive it! But we all know that while raw power is exciting, for true performance a supercar needs to be lightweight. Aventador uses a carbon fiber monocoque chassis to limit its weight, yet give it a strong platform. The car weighs in at 3,472 lbs., just about 120 lbs. more than both the current Chevrolet Corvette ZR1 and SRT Viper GTS. Not enough numbers yet? 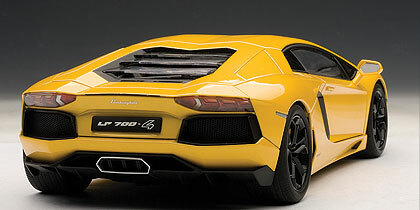 Aventador’s power to weight is a measly 4.96 lbs. per horsepower. Uh, not a lot of cars dip below 5 lbs. Sadly, we can’t drive our diecast dream cars. But Autoart gives you all the visual sensory stimuli you’ll need with its 1:18 model. The sample bright metallic yellow model is made from 327 metal and plastic parts. Autoart reports there are 127 metal parts and 29 photo-etched plates in this model, meaning detail is extra fine for the $219 asking price. Everything here opens, as you’d expect. The scissor-style doors flip up to create an unusual display. Inside you’ll find a flashy yellow and black interior, with yellow seats, console and detailed stitching around the dash. The speedster’s gauges and center console look realistic too with finely detailed instrumentation and gauge faces. The Aventador’s angular nose features the Lambo logo and the short hood raises slightly on realistic looking hinges – nothing to see inside there though. The front lights are spectacular, however, with a Y-shaped design inside the lens along with an individual projector beam. Taillights are equally detailed, but it’s what’s under the rear hatch that most collectors will enjoy seeing and displaying. There you’ll find the V12 with Lamborghini scrolled along the headers. 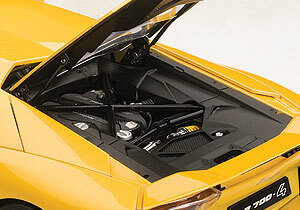 You can easily see the inboard shocks, also yellow, support bracing and a carbon fiber panel across the engine’s top. That flat rear window also is sculpted with three waves across it, reflecting the angular design of the rest of this supercar. Plus, once you’ve lifted the hatch, you can pull out and extend the rear spoiler, and workable side wings next to the hatch. And if you look at the car square on in back you’ll see a wide chrome-trimmed exhaust outlet. Check out the sculpted doors that lead back to photo-etched vent screens This looks like a dagger on wheels. 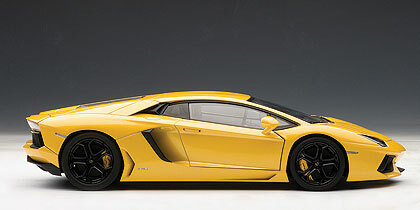 Along the sides, Aventador’s sculpted doors lead back into giant photo-etched screens and behind the oversized tires and racy five-spoke wheels are yellow Lamborghini-labeled brakes to accent the car as it sits in profile.Could this be more realistic? Well, if we could fire up this gorgeous engine and give it a test drive, I guess. 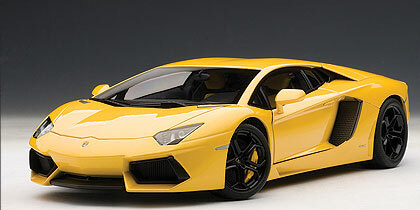 Autoart has again created a superbly detailed 1:18 supercar, and in this color it’s a spectacular addition to any modern era car collection … and that’s no bull! Prefer real cars? Visit www.savageonwheels.com to read 1:1 car and truck reviews by Mark Savage, or visit the Savage on Wheels Facebook page. The scissors action doors make this a gorgeous car to display, and the black and yellow interior is impressive, along with the realistic gauge faces. In the real deal this is a throbbing 12-cylinder engine.